Apano Village has been the mirror of Rajasthani culture since 1995. Started as part of ambience for a restaurant, over the years it has evolved as a tasteful and authentic symbol of ethnic village life of this most colorful state in the country. 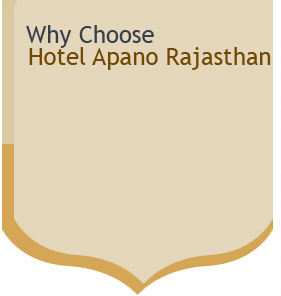 Today, the name of Hotel Apano Rajasthan is synonymous with Rajasthani culture in India . Spread over 5 acres of beautiful landscaped area for a rustic look, it is dotted with machaans & platforms where different folk artists perform concurrently. A village fair is created every weekend as an ongoing celebration of the rich & vibrant cultural heritage of Rajasthan. The display of traditional huts and workmanship will take you back to the times when splendor was unpretentious. Experience the rich warmth and rustic charm of a typical Rajasthani Village at Hotel Apano Rajasthan . Live dance and music performance all through the evenings is one of the major attractions at Apano Rajasthan. The exposure that the local folk artists have received has revived many of the arts and crafts that were getting all but forgotten in these modern times. Few visitors can resist the temptation to join the artists and dance with the music. The dining hall is renowned for the mouth watering and typical Rajasthani food, served to you on a platter in the tradition of Manuhaar. Your taste buds will remember this treat for a long time, while the warmth of service will stay in your heart forever. A display of old locks, arms and utensils give you a glimpse of an age gone by. The Haveli shows the artistic craftsmanship of our ancestors.